For the first time in American history, students in more than half of all U.S. states are paying more in tuition to attend public colleges or universities than the government contributes. The privatization of public education has been under way for decades but this inflection point was hastened by deep cuts states made to their higher-education appropriations in the midst of the Second Great Depression. For the United States as a whole, according to a new report from the State Higher Education Executive Officers Association, students and their families were forced to come up with almost half (46.2 percent) of total educational revenue for public colleges and universities in 2017. They had to pay only 28.8 percent of the total in 1992, a share that had risen to 36.2 percent in 2007. 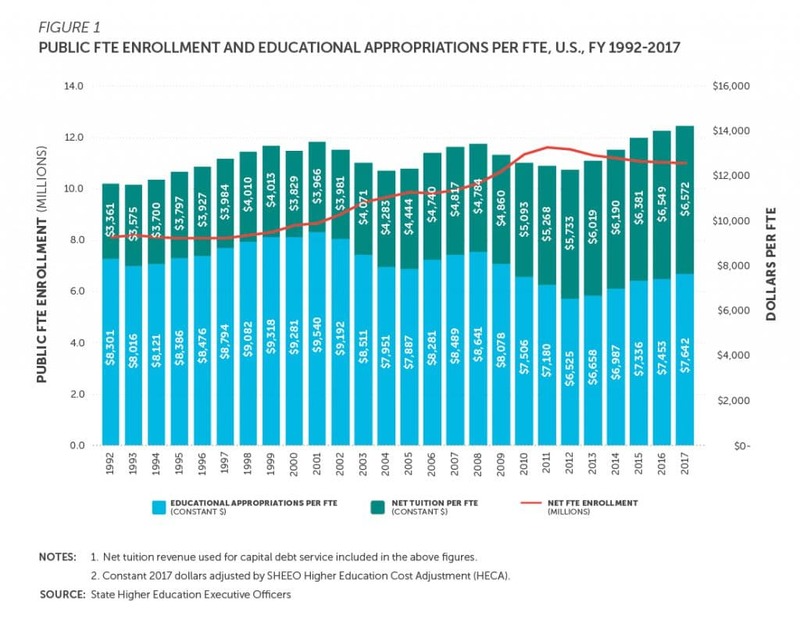 Figure 1, State Higher Education Finance (SHEF) Fiscal Year 2017, State Higher Education Executive Offices Association. Increasingly, public higher education in the United States is public in name only. And the privatization of the public educational system is costing the American working-class dearly. In 2016, net tuition for one student (full-time equivalent) came to 10.9 percent of median household income. That’s almost double what it was in 1992: 5.7 percent. Even as recently as 2007, it was only 7.9 percent. 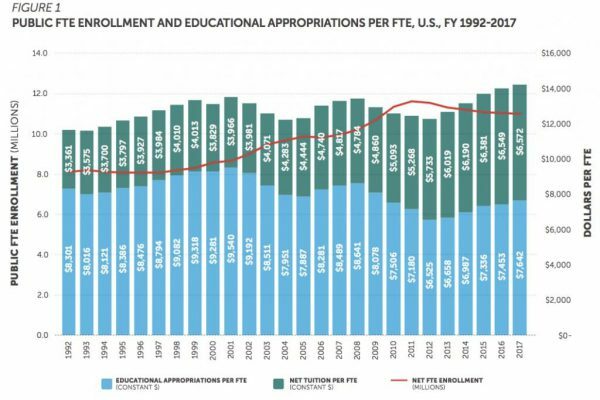 While public financing for higher education has improved in recent years, the overall trend of less public support and students having to shoulder more of the burden continues. After the crash of 2007-08, educational appropriations dropped 24 percent over four years, to $6,525 in 2012. This was largely due to accelerating enrollment growth (especially in community colleges) and the lack of proportional funding increases. Reversing this decline, appropriations have now increased for five straight years: 2.0 percent in 2013, 4.9 percent in 2014, 5.0 percent in 2015, 1.6 percent in 2016, and 2.5 percent in 2017. However, in 2017 states appropriated almost $2,000 less per student than they did in 2001, and $1,000 less than before the crash. What’s the American working-class to do? The same as in many other rich countries: demand free higher education for all high-school graduates who want to attend an in-state public college or university (and, while they’re at it, forgiveness for the student debts they’ve been forced to take on in order to attend increasingly out-of-reach public colleges and universities). David Ruccio (@Dfruccio) used to teach in the Department of Economics at the University of Notre Dame (until it was split and renamed) and then in the Department of Economics and Policy Studies (until it was dissolved). He is currently Professor of Economics “at large” as well as a member of the Higgins Labor Studies Program and Faculty Fellow of the Joan B. Kroc Institute for International Peace Studies. Ruccio blogs at Occasional Links and Commentary on Economics Culture and Society and is a contributor to the Real-World Economics Review Blog.